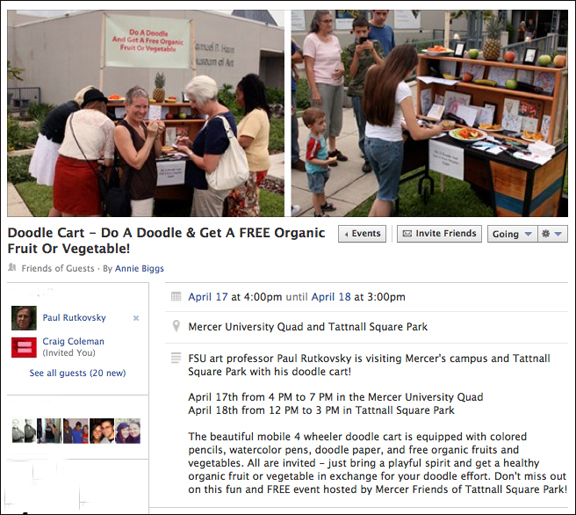 FSU Art Professor Paul Rutkovsky is visiting Mercer’s campus and Tattnall Square Park with his doodle cart. The beautiful mobile 4 wheeler doodle cart is equipped with colored pencils, watercolor pens, doodle paper, and free organic fruits and vegetables in exchange for your doodle effort. Hosted by Mercer Friends of Tattnall Square Park.